There are 4 luxurious pavilions at Maroc Lodge. All bedrooms enjoy wonderful views from the bay windows that open out onto the terraces and all have en-suite bathrooms with showers. Guests can relax out on their own private terrace or in the living rooms which have open fireplaces. The beds are all king-size, which can be separated to make twins, and are fitted with luxurious cotton satin sheets and in each room, there is a mini-bar, complimentary water Satellite TV, towels, luxury soaps, safe, heater and high-speed ADSL internet connection.Built in Berber style, the pavilion walls blend with the surroundings in soft earthy tones, while grey slate flagstones form the terraced roofs. Inside, traditional Moroccan style blends with international objets d'art and each pavilion has its own design with beijmats (floor tiles) from Fes, zelliges (coloured tiling) from Amizmiz, walnut woodwork and tadelakt. 1 double bed, 2 additional beds, sleeping up to 4 people. 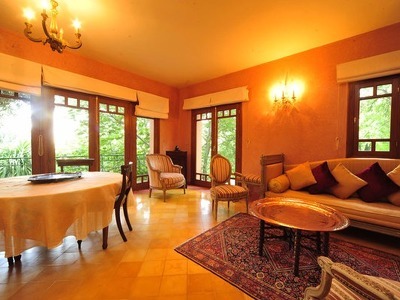 This air-conditioned room has a bedroom with bay windows that open onto a terrace. The extra beds (€50 / night /extra bed /including breakfast) can be set up in the sitting room which has a working fireplace. The bathroom is en-suite with a rainfall shower and there is a separate loo. 1 double bed, with the option of an extra bed, sleeping up to 3 people. 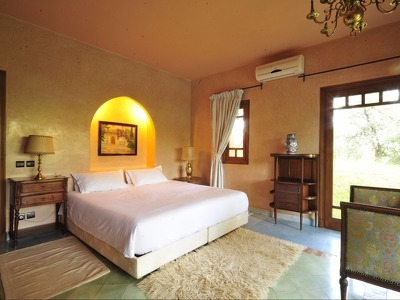 This air-conditioned room has a bedroom with bay windows that open onto a terrace. The extra bed (€50 / night /extra bed /including breakfast) can be set up in the sitting room which has a working fireplace. The bathroom is en-suite with a rainfall shower and there is a separate loo. 2 double beds, with the option of an extra bed, sleeping up to 5 people. 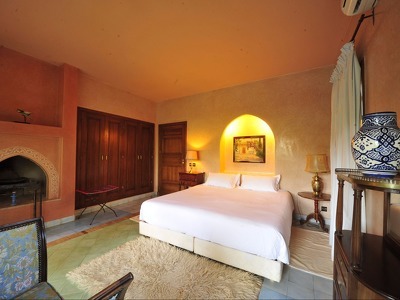 This air-conditioned suite has 2 doubles bedrooms with bay windows that open onto a terrace. The extra bed (€50 / night /extra bed /including breakfast) can be set up in the sitting room which has a working fireplace. The 2 bathrooms are en-suite with a rainfall shower and there is a separate loo. 1 double bed, sleeping, 2 people. This bedroom has bay windows that open onto a balcony and the sitting room has a working fireplace. The bathroom is en-suite with a rainfall shower and there is a separate loo. 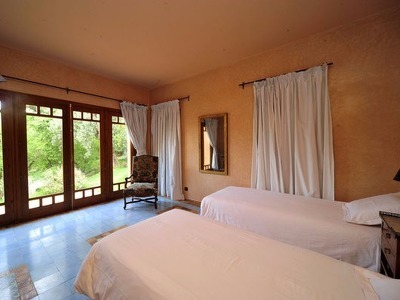 Maroc Lodge is a small luxury hotel in the High Atlas mountains, just 40 minutes from Marrakech. This Chic Retreat welcomes children and has 4 luxury pavilions, inspired by Berber architecture, built using natural local materials and local craftsmanship. Formerly the home of the personal physician of King Mohammed V and King Hassan II, family heirlooms and antiques sit alongside pieces from all over the world, and outside guests can enjoy views across the valley from the infinity pool surrounded by century-old olive and fruit trees. Relax in the pure mountain air, and de-stress in the hammam & spa with a traditional ghasoul clay treatment before a traditional Berber dinner using produce from the lodge's orchard and vegetable garden. This is a true paradise up in the mountains set on a beautiful 2-hectare estate. Maroc Lodge is the ideal place from which to embark on a trip to discover the Berber villages of the High Atlas mountains. Your hosts can arrange guided walking, mule, mountain bike and quad tours and the weekly Amizmiz souk is an easy walk from the Lodge. Private taxis can be arranged for day trips to Marrakech, the Ourika valley, Goundafa country, Tinmel mosque & Asni valley, Essaouira and Ouarzazate (which is a 2-day trip) and guests can even go skiing at the Oukaimden resort. Within the Lodge's estate, guests can wander among the almond, walnut, fig & pomegranate trees, take a walk to the natural spring which feeds the irrigation canal, a lovely trip through sarsaparilla plants past small wooden bridges, and end their trip with a cooling drink by the infinity pool which seems to flow from the mountain-side itself. The hammam & spa offer traditional Moroccan treatments with ghasoul clay, scrubs, henna, body wraps and massages. Meals can be served anywhere on the estate, by the pool, in the restaurant, in the living room or in the privacy of your pavilion. The chef makes the most of the Lodge's natural larder, with produce fresh from the vegetable garden and orchard or from the pioneering Moroccan company Le Marcher des Saveurs which produces its goods in an eco-friendly way. 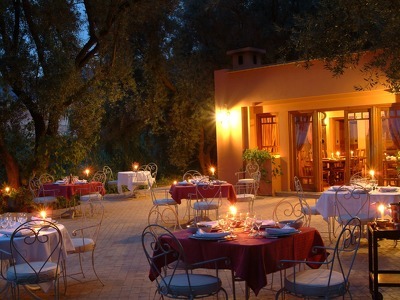 Dishes often incorporate Maroc Lodge's own olive oil, pomegranates, almonds, figs, strawberries and herbs. You'll be introduced to Berber cuisine with barley couscous, chicken tajine with honey, tanourt bread and some refreshing timija mint tea. For breakfast, enjoy a mix of Continental and Moroccan dishes with European and Moroccan pancakes, raïf (Moroccan pastry) with honey, traditional bread, homemade brioches, fruit salad, cheeses, yoghurt, home-made jams and eggs-to-order. The hotel can arrange transfers to or from Marrakech airport or medina. One way: €30 for 1-4 people. Nearest Airport: Menara Marrakech. Distance from Airport: 45 minutes. Transfers from and to the airport (Marrakech) are not included. We can arrange transfers from or to Marrakech airport or medina One way: €20 for 1-4 people (price double at night). There are 4 luxurious pavilions at Maroc Lodge. All bedrooms enjoy wonderful views from the bay windows that open out onto the terraces and all have en-suite bathrooms with showers. Guests can relax out on their own private terrace or in the living rooms which have open fireplaces. The beds are all king-size, which can be separated to make twins, and are fitted with luxurious cotton satin sheets and in each room, there is a mini-bar, complimentary water Satellite TV, towels, luxury soaps, safe, heater and high-speed ADSL internet connection. Built in Berber style, the pavilion walls blend with the surroundings in soft earthy tones, while grey slate flagstones form the terraced roofs. Inside, traditional Moroccan style blends with international objets d'art and each pavilion has its own design with beijmats (floor tiles) from Fes, zelliges (coloured tiling) from Amizmiz, walnut woodwork and tadelakt. Une petite merveille. Un havre de tranquillité. Très bon accueil . Tout le monde veut vous rendre service . Très propre. J'en garde un bon souvenir.